In precedent posts I've introduced some informations about power consumptions. As a rule of thumb, when configured as battery-operated devices, panStamps may drain a few microamps in power-down mode and a few miliamps when measuring and transmitting. Under these circumstances, powering a panStamp based board from a couple of AA batteries should give us an autonomy between one and three years, depending on the particularities of each project (consumption of the sensor, DAQ and transmission intervals, time remaining in Rx after each transmission, etc). Now I want to go a step further and create real autonomous wireless motes; no need to replace batteries at all since solar energy is available for free almost everywhere. Before adding more complexity to the hardware, I thought about checking this concept with a common solar battery, one of those cheap USB chargers for cell phones. The solar charger appearing in the above picture may seem somehow overkilled for our purpose; the most simple (and cheap) solar chargers may be used instead. The base board where the panStamp is plugged onto was originally designed to work as programmer and USB interface. It also includes a LDO, independent from the ft232 on-chip voltage converter, so that the FTDI USB chip can remain unpowered (through an external jumper) whilst the board can still be powered from an external 5VDC power supply. However, the above solution is not what I had in mind when I planned to build cheap and simple solar-powered devices. Thus, I needed to go back to the basis, restart my solar design and do things step by step. My first decision was to build a boost power supply where to base my solar design on. 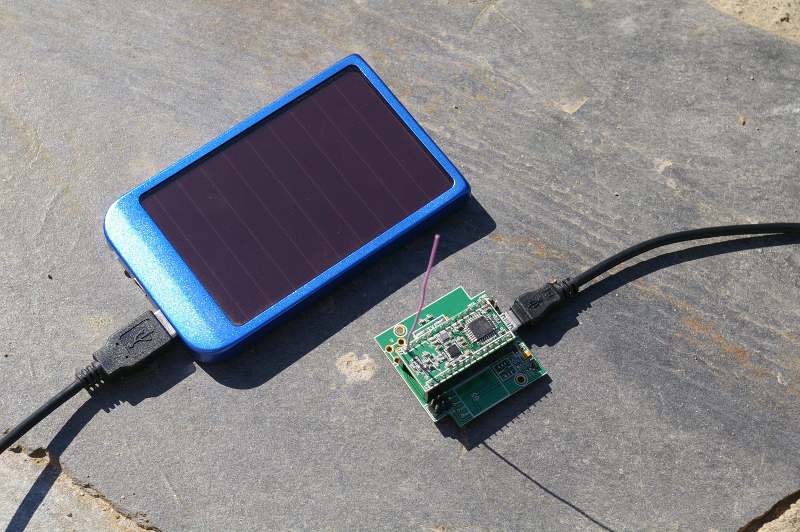 Powering a microcontroller from a solar cell is a bit more complicated than simply connecting the cell to the Vcc and GND pins. Voltages provided by solar cells are far from being constant and regulated. Moreover, I need to back up some of the power produced into a battery or capacitor. Finally, I want my solar kit to cost less than USD10. Otherwise I'd see no reason for abandoning the (above) USB solar battery approach. Regarding the step-up voltage regulator, the NCP1400 chip, made by ON Semiconductor, appears as a good candidate. 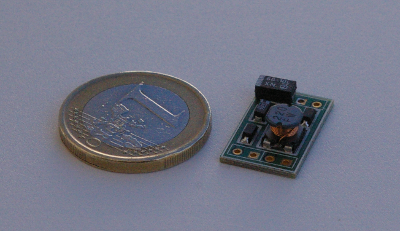 It costs less than USD1.0 and requires only a few passive components. This regulator is capable to start converting 0.8 V into other more usable voltages and keep conversions when the voltage source goes below 0.2 V. In order to test the samples received from the manufacturer, I built some small boards that will let me plug different power sources and storage devices. This step-up regulator is not only suitable for solar designs. Since it accepts low voltage ranges, I'll be able to power my panStamps from single AA/AAA batteries, ensuring that their charge will be drained more efficiently than simply connecting AA/AAA pairs as described in the precedent post. 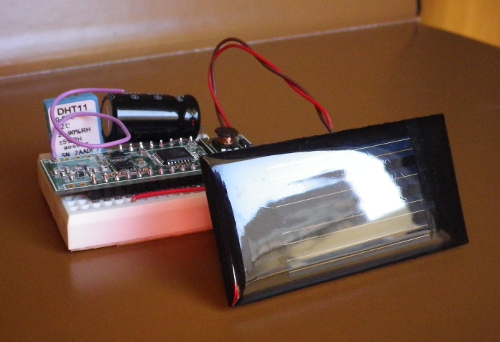 Finally, I ordered some cheap solar cells from Internet and a supercapacitor where to store the excess of power and keep the panStamp running through the night. The supercapacitor is a 6.6F 2.7V ELNA DZ one, purchased from eBay, that should show a low ESR (Equivalent Series Resistance), 0.2 ohms or so. Choosing a good supercapacitor is very important, not only for the amount of charge that it will be able to store but also for its rate of discharge. A low ESR ensures low current leakages. Figure 4: Cheap solar cells. 29 x 59 mm. 2V 45 mA under direct sunlight. 1. I need to look for more efficient solar cells, capable to produce a minimum of voltage and current even under low daylight conditions. In household applications, these solar-powered sensors won't rarely be placed under direct sunlight so my current solar cells are useless. 2. The NCP1400 board requires low ESR capacitors. Placing a good supercapacitor besides not so good filtering capacitors makes the whole design discharge quicker. As filtering capacitors I initially used some tantalum ones that I had in stock but later I realized that their ESR's were not acceptable for my design. Instead, I'll have to search better ones, with ESR's below 0.3 ohms. 3. I need to try other supercapacitors. The one purchased from eBay theoretically has an ESR of 0.2 Ohms but I've not been able to find the original data sheet. Indeed, I'd say that ELNA no longer makes this reference and, instead, Mouser and other distributors provide the 4.7 F value and lower ones. I'm beginning to question the quality of this 6.6 F supercapacitor. In summary, I guess it's an issue of replacing pieces in my current design. I'll try to document in future posts my progresses and other experiences about this exciting topic. I have enjoyed very much your blog. Thanks Juan for the link. Very interesting blog! Indeed Rob form ambienssensors makes a very high quality job with his scavengers. I too considered using the LTC3108 for my solar harvesters but then realized that was a bit overkilled. LTC3108 mainly focuses applications where the input voltage is minimal (20mV). However, solar applications rarely need such degree of sensibility. Instead, I've done a new design based on the MAX1724 and will probably try with a new IC that will be released by TI soon. I hope to come back with some results in two or three weeks!! Yes a DC-Converter seems to be a very good choice for wider input voltage range, and low quiescent current. Recently I was studying the PIC32-Pinguino schematic (http://pinguino.cc/download/schematics/PIC32-PINGUINO/PIC32-PINGUINO-schematic.pdf) and they have choosen the MC33063 (higher standby current than MAX1724, around 2.5mA, but also higuer output current, around 1.5A). An interesting detail about this design is that they have also included a li-ion charger with automatic power input switching. Pinguino probably needs more current than low-power wireless motes working at ISM bands. At least, the li-on battery lets me think this. Thanks for following this project!! 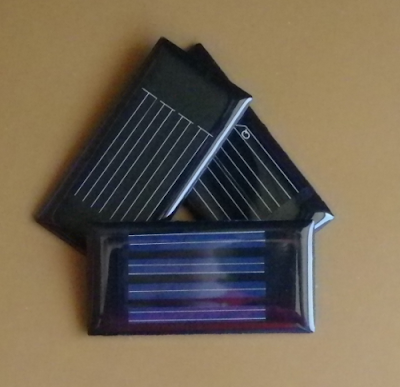 Today I have news about Clear´s SOIC solar cells (http://clare.com/Products/SolarCell.htm). Someone is using a pair of cpc1824 (4V/100uA) to power a cc2480 radio via a supercap (http://www.youtube.com/watch?v=8ixYQQ2pAT4). Those Clare's cells seem very interesting. Looking at the video they seem to provide enough current under artificial light. However, I don't know how they get to charge the supercap even with the maximum 100uA provided. I guess the video shows the application once the supercap charged, maybe after some hours under the lamp. I am not sure whether we could estimate the charging time using (V-V0)=(t-t0)i/C assuming i=0.0001A, C=1F and (V-V0)=4.. so the charging time to top 4V would be approximately 12 hours. I have found this paper about "Using small Solar Cell ans Supercap in a Wireless Area Network very interesting(http://www.sensorsmag.com/networking-communications/energy-harvesting/using-a-small-solar-cell-and-a-supercapacitor-a-wireless-sen-7310).